As Spring 2010 settled in, I found myself in a creative rut. Not that I wasn’t coming up with some pretty good instructional design solutions. I just didn’t have the sparkly “kick” in my design step. My first instinct in considering how to clear the innovation fog was to focus on learning something new about instructional design. “Surely there is some new technique or method out there that will inspire me back into my creative groove,” I told myself. Four hours of semi-conscious web surfing for articles on social networking, blogging, graphic design, and adult learning later, I was in no better creative place than when I first started this aimless journey. “A good night’s sleep will do the trick,” I murmured to myself in lieu of clicking the Facebook link one last time before throwing the creative towel. Another half hour passed, and while I now was up to speed on my Facebook friends’ opinions on skirt lengths, parasailing, potty training, and bar hopping, I was no closer to sleep than to a creative revelation. Defeated, I dragged myself to bed. No, this was not some animated .gif I would create for a PowerPoint presentation. Nor was it a racy idea for an attention grabber at the beginning of a module. I had realized that my creative sparkle could be restored through an age-old domestic act. Baking. I recalled seeing some Martha Stewart-y web article on “Cake Pops,” which showed fun bite-sized cake creatures perched firmly on a lollipop stick. “I’ll try it! Should be a piece of cake,” I chuckled to no one in particular, mildly amused by the metaphoric ease of my belief that the creation of these mini-masterpieces could be mastered in a single shot. So, 67 dollars and one maddening pre-Easter Michael’s trip later, I had everything I needed to make cake pops. Or at least that’s what the “easy cake pop instructions” recipe at Bakerella.com promised. What then ensued can only be described as a tortuous 12 hours of mixing, scraping, baking, shaping, smooshing, poking, and re-attaching nightmare. I kind of loved it, even though at one point I threw an unfrosted cake ball (a pre-cake pop iteration) against my refrigerator in disgust. My first cake pops were disasterously, unmanageably bad. Think of ABC gum smashed under an old shoe, then jammed with two jelly beans and told to stand up straight and look presentable. Yuck. 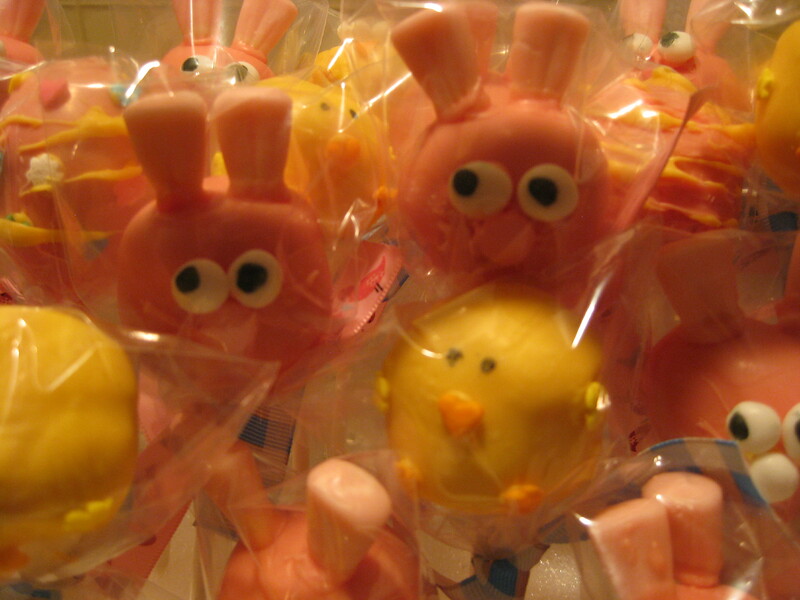 Two batches later, the sugared semi-orbs actually started to look like they were intended to look – bunnies and chicks. I was getting my groove now. The bunnies were pink with googly eyes and the beaks of the chicks looked as cute as they did real. Almost unnoticeably, I began putting my own twist on the not-nearly-as-easy-as-they-promised recipe instructions. After the final bunny was built and the last chick was cast, I was both mentally exhausted and creatively invigorated. After saran wrapping the last of the munchable art, I flopped into bed and was asleep in seconds. Getting out of my comfort zone for those 12 hours initiated a creative flow over the next week at work that shocked me. I was in the groove, coming up with innovative and simpler ways of training my customers. But what perhaps is even more exciting is the fact that I had a renewed verve for life in general. An extra spring in my step. And an almost constant feeling that I was just about to conjure another cool idea. Not because I’d attended a webinar in my field of study. Not because I’d read a book to enhance my expertise. But because I tried something utterly new. Moral of the story: Getting out of my comfort zone and trying something new initiated a creative flow in all areas of my life, both personal and professional. The simple (okay, not exactly simple) act of learning to do something I had never done before restored my curiosity, my creative inspiration, and even my confidence. And the learning was not in my area of expertise. In fact, prior to that day, I would not call myself a baker of any kind. You can create your cake and eat it, too. Hilarious! You should write more about your adventures, Susan. I can relate to the slump. Now I need to figure out my own Cake Pop idea. This story is fun and inspiring. Makes me want to bake. So, what is your next creative adventure going to be?